I choose happiness and magic and trust the process. What is happening right now in your life? Do you feel lonely and not supported ? Do you feel stuck in any area of your life ? Do you feel like you do not belong here? Do you feel like nobody listens to you or understands what you want to say? You feel safe and loved. Your opinions matter and are very important to others. Now, imagine your life if things were different. How does it feel to know your relationships are heart connected? How does it feel to know when you speak your truth it makes a difference in the world? How does it feel to know you are home? 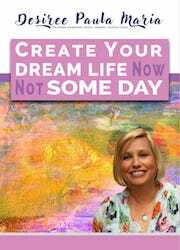 How does it feel to know you can rewrite your life story? To get started, click on the link below to schedule a free, no-obligation, 15-minute discovery session. Yes! I am ready. Show me how to make these changes in my life! 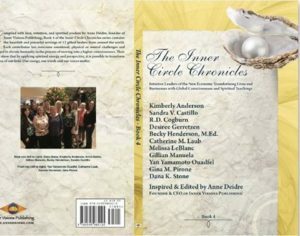 Compiled with love, intuition, and spiritual wisdom by Anne Deidre, founder of Inner Visions Publishing, Book 4 of the Inner Circle Chronicles series contains the heartfelt and powerful writings of 12 gifted healers from around the world. Each contributor has overcome emotional, physical or mental challenges and emerged to elevate humanity in the process of moving into a higher consciousness. Their works show that by applying spiritual energy and perspective, it is possible to transform any area of our lives. Our energy, words and voices matter.